There seems to be a flat limit on how many can be held on the device and SD card. So you've got your shiny new Nintendo Switch and you're finally playing the exciting and gorgeous Breath of the Wild. You're snapping that screenshot button every chance you get. A new helmet! *snap* A funky looking korok! *snap* I'm on fire! *snap* You probably sit back and start to think to yourself, "I've taken a lot of screenshots. Have I taken too many?" Don't worry, someone has already made sure to do that ahead of time, and it turns out that the Switch will tell you when you've actually gone too far. Reddit user megamilkybee seems to have had a bit too much fun playing photographer in Breath of the Wild — though who can blame them — and inadvertently discovered a limit imposed by the Switch on how many screenshots can be saved. 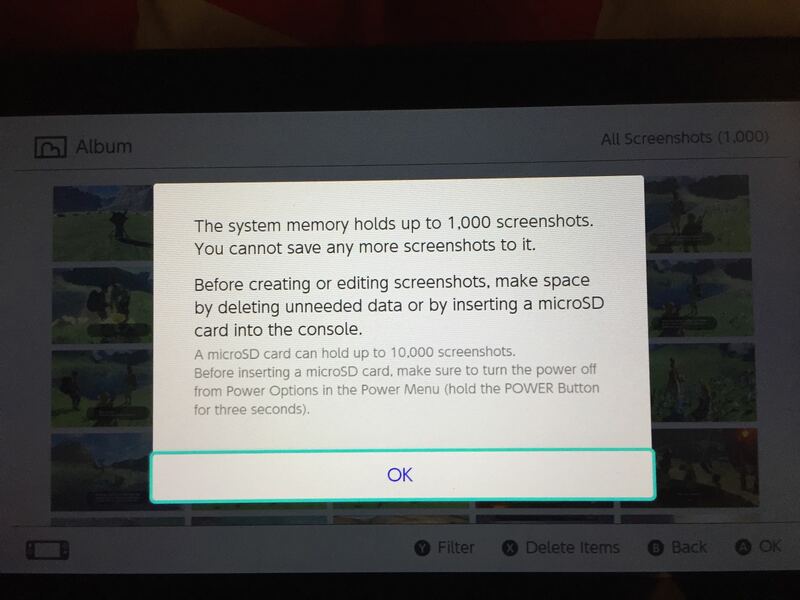 Apparently "only" 1000 screenshots can be held on the Switch itself. If you have an SD card inserted then that cap is increased to 10,000 instead. I would guess that most people will invest in an SD card to accompany their Switch, given how small the built-in storage is by default, and I doubt many will reach that 10,000 screenshot limit any time soon. It's definitely a bit odd that they attached a flat number to it rather than an amount of space, but I don't see it being a big deal. If you're playing your Switch enough to have time to take that many screenshots this early on, then clearly it's doing something right.